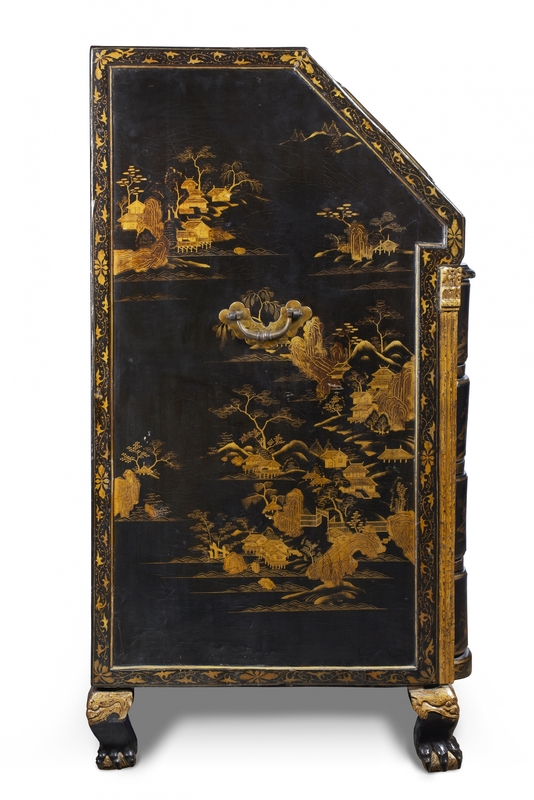 An exceptionally beautiful lacquer bureau manufactured in China according to a Dutch model and shipped to Europe circa 1730-1740. The lacquer is of Chinese origin which is quite extraordinary. As the Dutch East India Company (the V.O.C.) was of the opinion that large pieces of import took up too much valuable space in their trading ships, very few Chinese furniture pieces were crafted for the Dutch market. Even less have survived the test of time. Decorated throughout with gilt landscapes and floral details on a black lacquer background. The drawers, fall front and side panels are richly adorned with images of Chinese pavilions surrounded by pine trees and weeping willows. The interior of the desk consists of twelve drawers with a floral decor and two standing fluted drawers trimmed with capitals and basements. The centre features a cupboard door with a decoration of a vase filled with flowers, a symbol of peace and tranquillity in China. 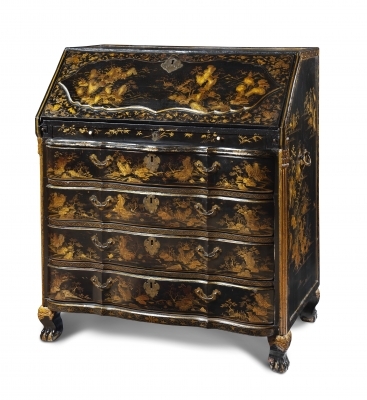 The interiors of the drawers are finished with gold powder lacquer. All drawers are inscribed with a Chinese character. The desk also contains a storage compartment, which opens with a sliding panel (in French: à coulisse, in Dutch: keldertje). Beneath the fall front are four drawers flanked by fluted and gilded stiles. The Chinese cabinet maker has followed his own interpretation of the claw-and-ball feet motifs, which feature t’ao t’ieh masks above them. This motif of an animal mask dates back thousands of years and can be found on Chinese bronzes from before the Christian era. The bureau’s manner of construction is quite interesting and is carried out in cypresswood which differs from the wood used by European craftsmen. The joints of the drawers are not forked as they usually are in Europe but rather rectangular in shape. This writing desk was made after a Dutch example. It was crafted especially for the Dutch market, rather than to the taste of English buyers, as is made clear by its slightly organ-curved front. From circa 1730, these fall front bureaus were quite popular in The Netherlands, often featuring diagonally positioned side stiles. This Chine de commande bureau is exceptionally well-preserved with its original brass handles and lock escutcheons. As far as is known, it is the only remaining bureau of its type from the period that was intended for the Dutch market. Laquer is the natural sap or resin from native tree species in the Far East and South East Asia. It is extracted through numerous horizontal incisions in the tree bark, from which the resin then slowly seeps. After numerous procedures such as filtering and evaporation of superfluous water, one can speak of the actual paint. This lacquer paint has special qualities. 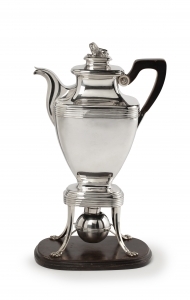 It protects the object to which it is applied from external influences such as humidity and beautifies the object by forming a shiny film layer that is very suitable for decorative techniques. This paint is very durable. 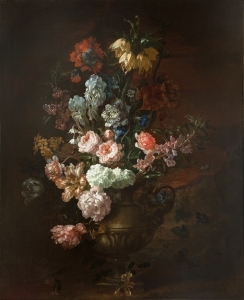 The decoration was the last stage of the production process of lacquering objects. Lacquering was a delicate process in which several coats were applied over each other: the first layer had to be completely dry and solid before another could be added. A lot of oxygen, high humidity and heat is required during drying. The quality of Chinese and Japanese lacquer was excellent and the price was high due to the labour-intensive production process. The directors of the V.O.C. were mainly interested in profit and when the import prices got even higher around 1685, they looked for other ways to obtain the same product. 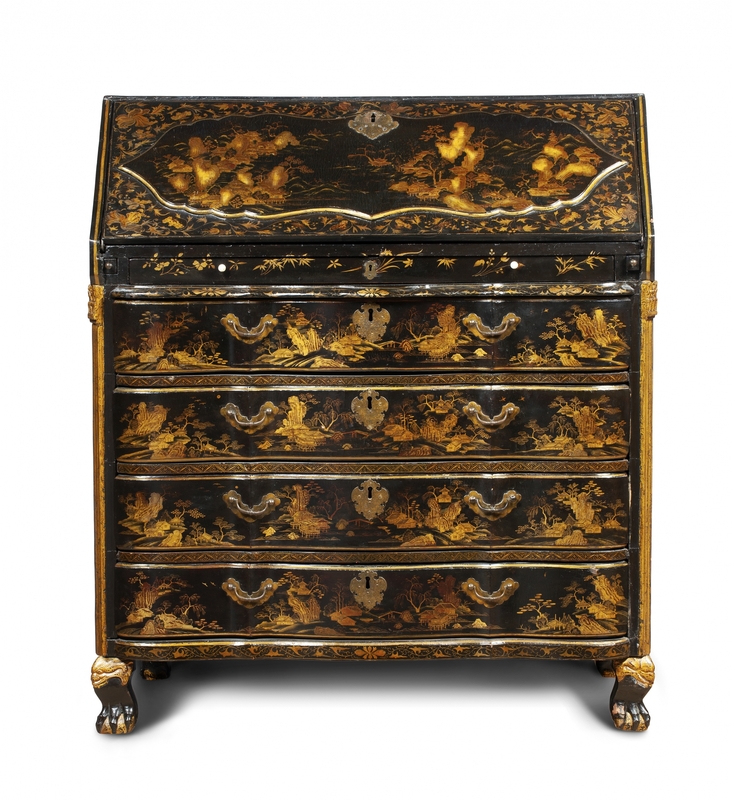 From early on, attempts were made in Europe to imitate Eastern lacquer. The process of lacquering was extremely difficult to imitate in Europe in particular because the main component Rhus Verniciflua could not be cultivated here, nor could it be imported from China. During its long voyage, the lacquer dried up and was no longer of use. The London publication of A Treatise on Japanning and Varnishing by John Stalker and George Parker in 1688 caused a major breakthrough in Europe. The book provided craftsmen with recipes and formulas, as well as many motifs and pattern illustrations to follow. However, despite its success this European imitation never reached the high-gloss and solid quality of the original Oriental lacquer. The V.O.C. continued to import lacquer from China and Japan. After 1693, Japanese lacquerware can no longer be found in the V.O.C. books, probably because it had become too costly for import by then. European fashion and production of unique imitation lacquer must have also contributed to the halt of its import. The demand, however, remained high. In 1730, the Lords XVII, the directors of the V.O.C., sent a number of models of Japanese lacquerware to Batavia with the question if it could be produced for a lower price in China. After 1729, a direct sailing route was used from The Netherlands to Canton and the trade no longer went through Batavia. The Middelburg chamber of the V.O.C. auctioned off a large quantity of tea trays made of Chinese lacquer in 1734. It was a great success and more was ordered in China. 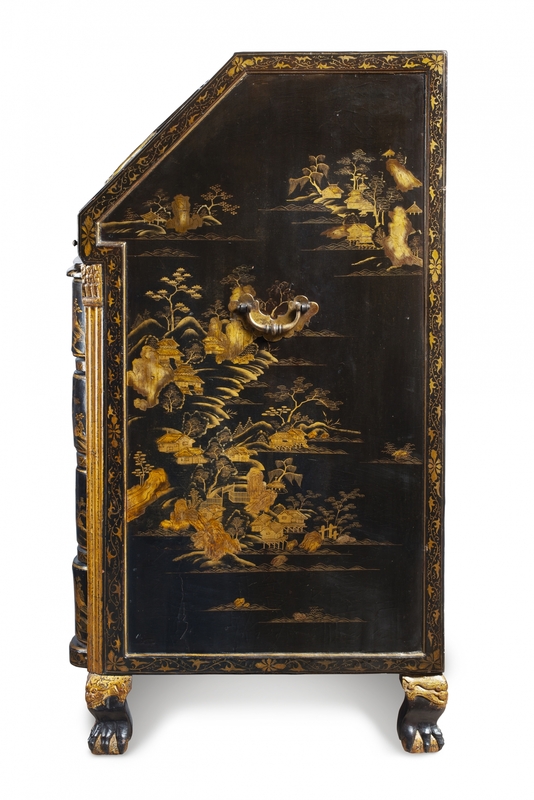 In 1737, two shipments of lacquer trays were ordered: one for Amsterdam and one for Middelburg. Each city received three boxes with the same content. The first shipment box also contained a ‘cabinet’ or ‘writing office’, and in it had been packed a table-top (without a foot element) in the lower drawer, 5 trays in the second drawer, 15 elongated trays; in the third drawer 45 elongated tea trays, 5 sets of 5 pieces of powder boxes and so on. Each drawer was packed with smaller pieces of lacquer. The second box had the same contents and the third one was packed with 500 serving trays and 500 tea cups. Presumably this flap front bureau is one of the four writing desks that were purchased in Canton in 1737. The purchase lists reveal that cabinets were no longer ordered in the following years. 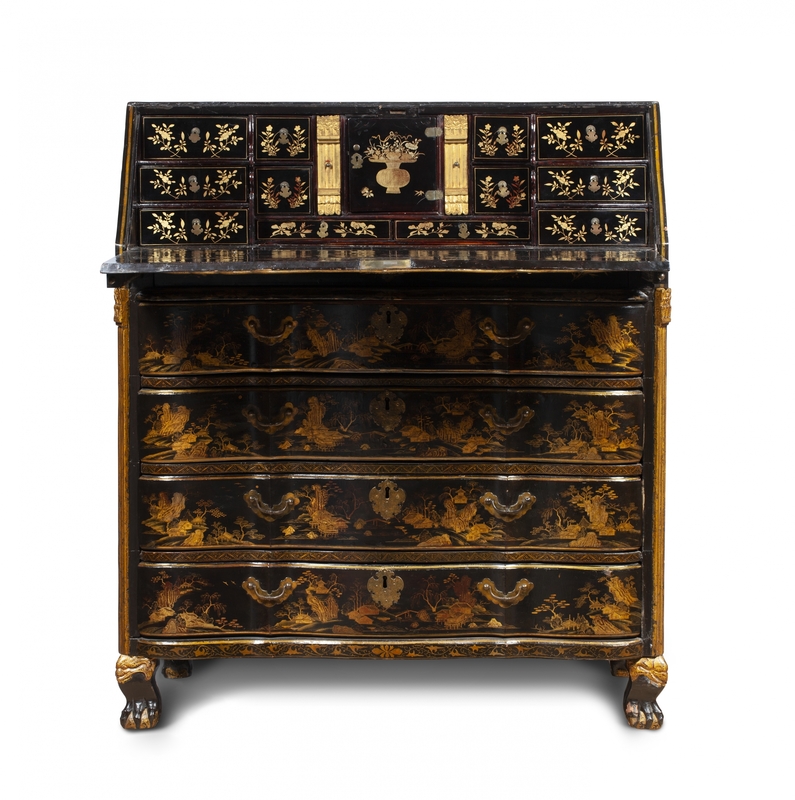 This lacquer bureau is one of the four writing desks that were purchased in Canton in 1737 and as far as is known, this is the only remaining bureau of its type from that period. C.J.A. Jörg,’De handel van de V.O.C. in Oosters lakwerk in de 18de eeuw’, In: Nederlands Kunsthistorisch Jaarboek , jr. 31 (1980), pp. 355-363. Annigje Hofstede, Nederlandse meubelen van Barok tot Biedermeier, 1700-1830, Waanders, Zwolle 2004, pp. 35-37.